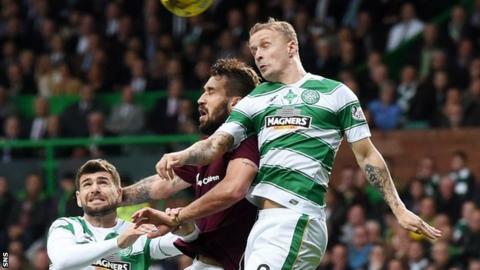 Blazej Augustyn says Hearts can pip Celtic to this season's Scottish Premiership title. The Polish defender's remarks came the morning after Celtic lost 2-1 to Ajax. "We can see Celtic are not as good as a few years ago and I don't think they have a team like they had before," said Augustyn. "I think we are good enough to win or stay close to Celtic. We win against good teams and we play good football. We can do it." Hearts sit in second place, six points behind the reigning champions after 15 games of the current Premiership campaign. Robbie Neilson's side missed the opportunity to narrow the gap last weekend as they were held to a draw at home to Dundee as Celtic also dropped points against Kilmarnock. Augustyn takes heart from Celtic following that up with a defeat that means they cannot now qualify from Europa League Group A. "But we have to step on the floor and work," he said. "That's why Robbie gets us to work hard and we just follow his way." When it was suggested that Hearts winning title a year after being promoted would be a major surprise, the summer signing did admit it would be a shock for Celtic. "Maybe it will be a big surprise to them, but not for us because we are working for that," he said. Augustyn knows Hearts will have to improve on their second-half display against Dundee when they visit Motherwell on Saturday. "Robbie says every day that the period from December to January, we can win the league or fight for the top three," he said. "But we have to be focused on the games and we can't draw games like that at home." Neilson was quick to play down the words from his defender, saying their main aim is still to finish in the top six. "We are not going to get carried away." the head coach explained. "We are still a team that are developing and, if you want make any sustained challenge in the league, you have to win games against Dundee at home and away to Motherwell on Saturday and I don't think we are quite ready to do that yet. "We will push as hard as we can, but ultimately we are looking at the top six and we are sitting in a good position to do that at the moment."